The process by which bone is formed is termed osteogenesis or ossification. Bone is never formed as a primary tissue: it always replaces a preexisting support tissue. There are two types of bone formation: intramembranous and endochondral ossification. Endochondral ossification involves the replacement of a cartilage model by bone. This ossification process can be studied in the long bones, such as the bones of the limbs. In a typical adult long bone, one can distinguish grossly a cylindrical shaft or diaphysis of compact bone (with a central marrow cavity) and, at the ends of the shaft, the epiphyses, each consisting of spongy bone covered by a thin peripheral shell of compact bone. In the growing long bone, the epiphysis and the diaphysis are united by a transitional zone called the metaphysis. Zone of reserve cells: A thin layer (3-6 cells wide) of small, randomly oriented chondrocytes adjacent to the bony trabeculae on the articular side of the growth plate. Zone of proliferation: Chrondrocytes are stacked in prominent rows and the cartilage matrix becomes more basophilic in this zone. Mitotic figures are present and the axis of the mitotic figure usually is perpendicular to that of the row of chondrocytes. Zone of maturation: No chondrocytic mitoses; gradual cellular enlargement. Zone of hypertrophy: Chrondrocytes and their lacunae increase in size. Zone of calcification: Deposition of minerals in the matrix surrounding the enlarged lacunae causing cell death. Zone of ossification: Osteoblasts deposit bone matrix on the exposed plates of calcified cartilage. Zone of resorption: Osteoclasts absorb the oldest ends of the bone spicules. Note the high vascular density in this area: one capillary loop for each chondrocytic column. Narrow partitions of calcified cartilage are left behind as the bone grows in length. Endochondral ossification spreads from the primary ossification center toward the ends of the cartilage. Identify portions of three long bones, arranged in a linear fashion, separated from each other by a relatively narrow clear space (the joint space) and surrounded by soft tissues. Each growing bone consists of cartilage at its extremities (upper and lower epiphyseal cartilages) and a pale-staining marrow cavity surrounded by bone (periosteal or diaphyseal bone collar). In some slides, the periosteal collar is sectioned tangentially. Under higher magnification, notice that the upper and middle parts of the epiphyseal cartilages. Observe the normal hyaline cartilage with a basophilic matrix and with chondrocytes distributed in isolated lacunae. Below this are columns of cartilage cells. Towards the center of the bone, note that the chondrocytes have become enlarged (or hypertrophied). Toward the marrow cavity, the cartilage matrix appears as calcified partitions that are stained intensely deep purple with basic dyes. Between these partitions, one may identify dying cells, empty lacunae as well as lacunae that have been opened up and occupied by the vascular, invading osteogenic connective tissue. Finally, projecting into the marrow cavity are mixed spicules, each with a deep purple calcified cartilage core clothed by osteoid tissue (pink). The primary marrow cavity is surrounded by the periosteal bone collar. This bone is of the immature type, which develops through the process of intramembranous ossification. 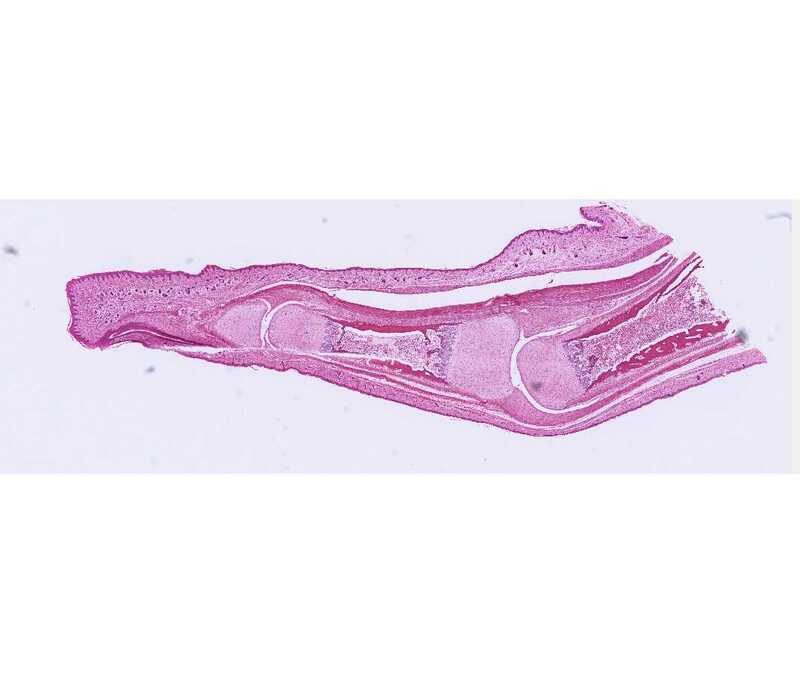 In some slides you can identify the periosteum and distinguish between its inner layer, which is richly provided with pale osteoblastic cells, and its acidophilic outer layer, which is predominantly fibrous. Also identify the soft tissues that surround the developing bones. As the primary ossification center of the diaphysis advances toward the epiphyses, each epiphyseal cartilage continues to grow and the whole cartilage model increases in length. This and the extension of the primary ossification center result in a sequence of changes in the chondrocytes of the epiphyses, which is similar to, but more extensive than, that described for the establishment of the primary center. Observe the zones of reserve cells, proliferation, maturation, hypertrophy, calcification, ossification and resorption. #95 or #97 Finger, monkey. 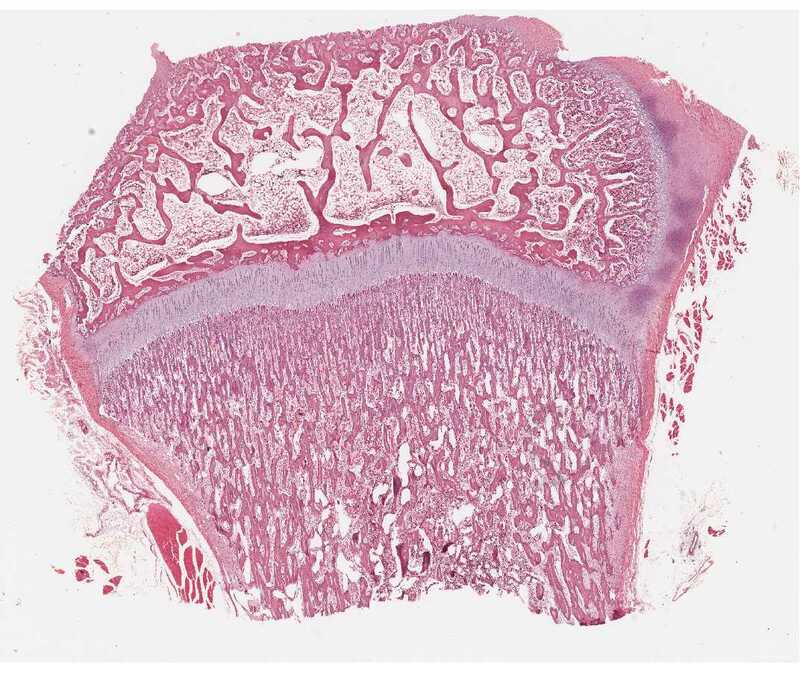 This is a longitudinal section cut through a metacarpo-phalangeal joint and an interphalangeal joint (#97), or through an interphalangeal joint (#95). With the naked eye, locate the ends of two long bones participating in the joint and identify the articular cartilage, the epiphyseal spongy bone, the epiphyseal disk, the metaphysis, the marrow cavity, and the diaphyseal bone. A secondary ossification center has developed into a bony epiphysis. Enlargement of the epiphysis occurs by growth of the articular cartilage. Again, observe the zones of reserve cells, proliferation, maturation, hypertrophy, calcification, ossification and resorption. While endochondral ossification has virtually ceased at the epiphyseal surface of the disk, it is still continuing at its diaphyseal surface (i.e., in the metaphysis). When growth ceases, the epiphyseal disk is entirely replaced by spongy bone and marrow. This is spoken of as the closure of the epiphyses. Early stages of this process may be seen on some class slides (e.g. #95). The epiphysis and diaphysis thus become united by bone, a union that is visible in the adult as the epiphyseal line.